Woodside No1 Drift (Derbyshire) sinking started 1948, and opened in 1950 by the NCB was closed 29th April 1966 after 13 years. Originally it was called Shipley Drift as it was situated at Shipley between Ilkeston and Heanor. Highest manpower was 387 in 1964-1965 and in the same year the highest output of 174,089 tons. A Swedish Sandvik steel bank conveyor was installed in the drift (first of its kind in UK). Adit position of the Drift 43/4444/420602, 261 ft (79.5m) above sea level and Sam’s shaft 433/4444/455712, 272 ft (83m) above sea level. 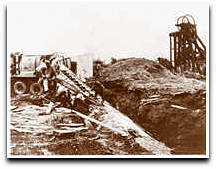 A major pumping scheme was installed at Woodside shafts near Ilkeston dealing with around 3,000 gallons of mine waters per minute from several old mines surrounding with connections through to Woodside. Some 993,633,000 gallons pumped in 1990. Hugh Gaitskell, Minister of Fuel and Power (Lab) made a visit to the mine. 1964/65: 174,089 tons max, 387 men max. 1966/67: 4,736 tons, 64 men. Drift mine ceased production April 1966. Under the authority of the Divisional Production Department until closed. John Dow (3090) Manager 1963-1966. Ken G Edwards (5826) 1964-1066. Woodside Piper seam abandoned July 1966, worked towards 75 feet (23m) cover line to surface and old opencast workings. Manager John Dow (3090), Surveyor Ken E Nicholson (2202). Tagg Hill Air shaft was located in the Woodside workings, position SK 443150, 346040. 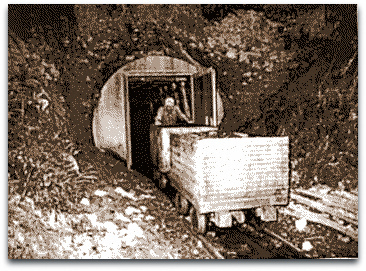 Harper Hill drift mine (Nottinghamshire), (Horace Taylor, Whatstandwell), died Feb 1987 aged 77. It was situated off Chesterfield Road near Huthwaite first developed in 1943 and was abandoned in Nov 1966 after 23 years. The first rooms in the Dunsil seam were worked from the right hand drift and that area finished in Dec 1950. 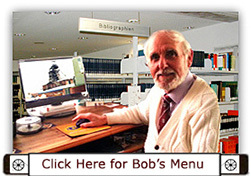 The second drift rooms started Sep 1950 and finished in July 1952. The Waterloo seam drifts began in Dec 1952 dipping at about 1in5 with one drift at 1in2. The area was later opencasted by Murphy Bros contractors from Wild Hill to the City of Whiteborough and Whiteborough farm extracting 2,500 tons of 1st Waterloo and 18,000 tons of 2nd Waterloo and then the area was landscaped. Some ancient workings were exposed whilst open casting, an area app 32m x 24m app 32m from the road and about 165m to the top end from the bend to Newton Wood Lane on Chesterfield Road. Bernard Bailey and I resurveyed the mine in Jan / Feb 1961 as we had been requested by the NCB No4 Area Surveyor to check the workings for royalty purposes. We re-correlated the headings from the existing ground features and levels as on the Ordnance Survey plan for that area. We agreed with the surface position and the direction of the headings but found some inaccuracy at the inbye end due to lack of adjustment for angle of dip and some errors in the flanking rooms that were still open or working as against surveys by Coke Turner and Co. The workings finished min 260m away from old Dunsil workings from Whiteborough pit. John Henry Webster drove the lorry to transport the men to work and back home as well as delivering coal. ‘Cadger’ Hardwick from Tibshelf visited the mine daily to check on the water levels and pumps. Ave 13 men u/g, 2 on s/f. Arnold Heappey (2nd) (at closure). Dunsil and Waterloo seams had been worked by the room and pillar system. clunch, 4½“ (0.11m) brights, grey clunch floor. coal 1’ 2”, (0.81m, 0.10m, 0.51m, 0.02m, 0.36m). Abandoned due to economic workable reserves.